In 2008, Kentucky filed suit against 141 Internet gambling domain names including PokerStars.com and FullTiltPoker.com. Now, Kentucky is back with another list of requests. Also in this edition of the Nightly Turbo, the International Stadiums Poker Tour has released more details about its $30 million event at Wembley, an online poker buzz had made its way to Washington, and more. Kentucky is claiming rights to the four online poker domains named in the Black Friday indictments. Find out what else Kentucky requested when it filed a claim in the U.S. District Court of the Southern District of New York last week. Cardroom International also filed a lawsuit against FTP and PokerStars last week. Here's a breakdown of the suit and what Cardroom International wants from its competitors. The PokerStars European Poker Tour gets under way in San Remo later this month. Are you planning a trip? Check out our guide to the city in the latest edition of the PokerNews Jet Set. On Thursday, the South Point Casino in Las Vegas is launching the first casino-based poker site. We spoke with the casino's owner, Michael Gaughan, about what he plans to do with the new poker room. Did you miss Tuesday's coverage the World Series of Poker on ESPN? Check out our recap to find out who advanced to Day 7 of the Main Event! Macau's year-over-year gaming revenue grew 39 percent in September, but that wasn't good news. Inside Gaming has the scoop on why Macau casino operators saw their stocks plummet last week. How has theFull Tilt Poker issue affected players at the nosebleed stakes? Scott “URnotINdanger2″ Palmer talks about his life post-Black Friday in the latest PokerNews Podcast. The European Poker Tour Main Event in London was down to 24 players on Wednesday. Find out who was still in contention for the top prize of £750,000. Seventy-five of poker's elite players entered the £20,000 High-Roller Event at EPT London. PokerNews recapped the action as field was trimmed to 30 on Day 1. 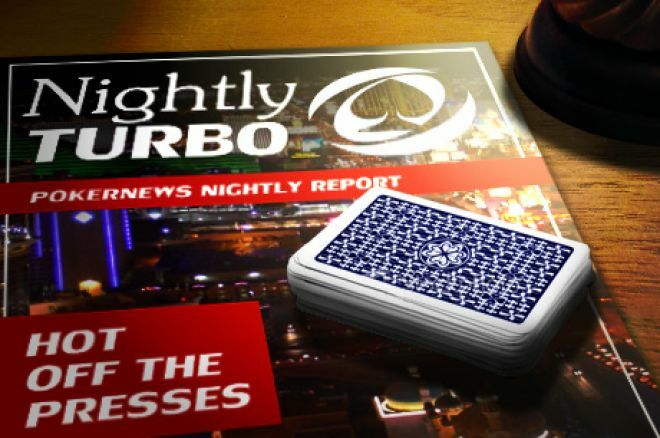 In Monday's edition of the Nightly Turbo, we featured a story about the launch the International Stadiums Poker Tour (ISPT), an organization backed by Groupe Bernard Tapie. There wasn't much info provided except for a tournament with a hefty $30 million guarantee taking place at Wembley Stadium in London. But it got our attention. And on Tuesday evening, the website was updated with more information. According to the site, ISPT is "a poker tournament organized each year in internationally renowned stadiums." The Wembley event is the first on the schedule and will take place over five days some time between Aug. 15 and Oct. 9, 2012, with the final dates to be released by Wembley after the national soccer team calendar is published next month. Still a bit vague, but at least we're getting somewhere. The tournament itself will begin with up to 30,000 players, all of whom will have qualified online, playing a shootout format using electronic pads offered to them from their seats in the stadium. Then, after the first round, the remaining players will move to actual tables laid out on the Wembley lawn. Play will continue until a winner is handed a top prize of $10 million. This is a very unique idea and we're interested to see how it develops. In the meantime, have another look at the advert. It's still awesome. For more information, visit the ISPT website. Online Poker Creating Buzz in Washington? The opening of the Global Gaming Expo (G2E) in Las Vegas on Tuesday brought some good news for online poker players. The American Gaming Association (AGA) announced its support for federal regulation in the U.S. and said it intends to press lawmakers to pass legislation that would permit land-based casinos to offer online poker to residents on a state-by-state case. AGA executive Frank Fahrenkopf said Tuesday that he's optimistic a new bill will be introduced to Congress before the end of this year. "We're perhaps closer to federal legislation than we've ever been," Fahrenkopf told reporters. "There's a buzz in Washington about the need for action." Fahrenkopf said he and his staff have been meeting with more than 100 newly elected lawmakers. He added that the most recent bill introduced by Rep. Joe Barton in June has lost steam, and the AGA is seeking a sponsor to step up and introduce a bill that the organization supports. For more, check out the story from the Associated Press. Just days after proposing to British model and actress Elizabeth Hurley (she said yes), cricket legend Shane Warne and the Crown Poker Room announced the schedule for the ShaneWarne.com Super Stack event from Oct. 21 through Oct. 23 in Melbourne, Australia. The AUD$300 buy-in event has two starting days and offers Crown players a chance to rebuy on Day 1b if they're eliminated on Day 1a. The event will conclude on Day 2 (Oct. 23) when a champion is crowned. Warne, 42, has taken occasional breaks from cricket to turn his competitive fire to poker. His biggest accomplishment on the live circuit was a third-place finish at the 2010 Victorian Poker Championship at the Crown Casino in Melbourne. Warne earned AU$40,000 in the event, which was won by Aussie pro Jonathan Karamalikis. Tournament details for the ShaneWarne.com Super Stack event can be found at the Crown Poker website. The PokerStars.net Australia and New Zealand Poker Tour Darwin kicked off this week with the $2,200 Main Event. Lee "Final Table" Nelson won the ANZPT event in Melbourne last week, and 64 players showed up in Darwin to follow his lead and take a shot at the $128,000 prize pool. The modest field still managed to produce a talented field as former ANZPT Perth champ Grant Levy and former APPT winners Aaron Benton and Marcel Schreiner were in attendance. At the end of two Day 1s, 47 players had survived with Australia's Roy Hills leading the way. Benton and top Aussie online pro Brendon Rubie were also among the top five stacks entering Day 2. Follow the live reports over at the PokerStars Blog for the latest updates from Darwin. Steve O'Dwyer was cruising on Day 4 of the European Poker Tour London Main Event. PokerNews' Sarah Grant caught up with "MrTimCaum" to talk about his recent move to Malta, the story behind his online moniker, and more.